Fun adverts, two hip art world jurors, and the 500x openness to experimentation has created an exciting college art exhibit. Jurors Cris Worley—owner and director of Cris Worley Fine Arts in Dallas— and Erick Swenson—international art star— selected 43 from 900 pieces, presenting a strong exhibit of what turned out to be primarily Metro-plex talent. Occupying both floors and resisting the “more is better” tendency, the show has a sprawling, spacious quality. The majority of pieces display a figurative inclination and graphic strength conveying resolved consideration, yet there are also several surprises including some accomplished ceramics. 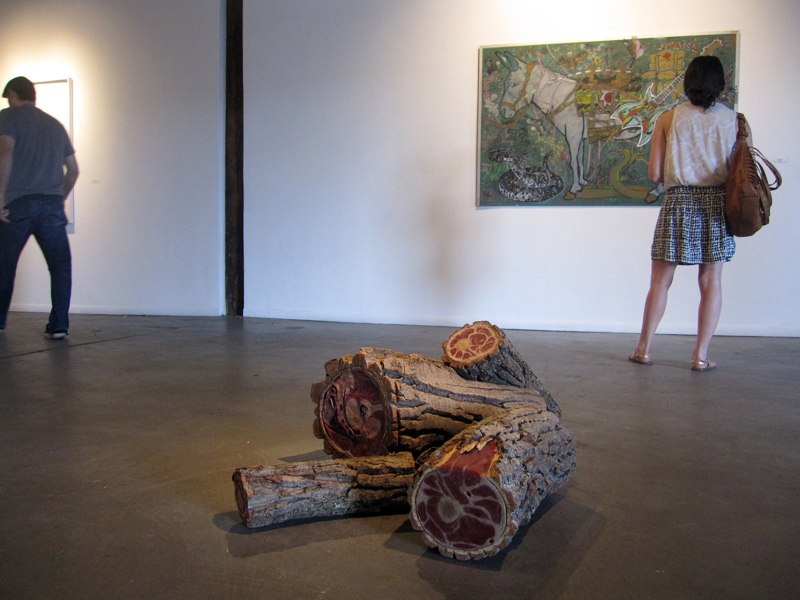 Not surprisingly one work resembles Fresh Meat: chopped logs filled with silicon representing muscle, fat and sinew. Amputee by Rachel Muldez [UD] is an anthropomorphized and didactic reminder of our planetary destruction yet remains disgustingly, darkly humorous, overcoming it’s preachiness through craftsmanship and humor. Many of the works exhibit a similar methodology, combining craftsmanship and boldness with tongue-in-cheek irony. Gregory Ruppe’s [TCU] graphic mash-up paintings satirically combine a Pop Anime stylization with Chinese scrolls. 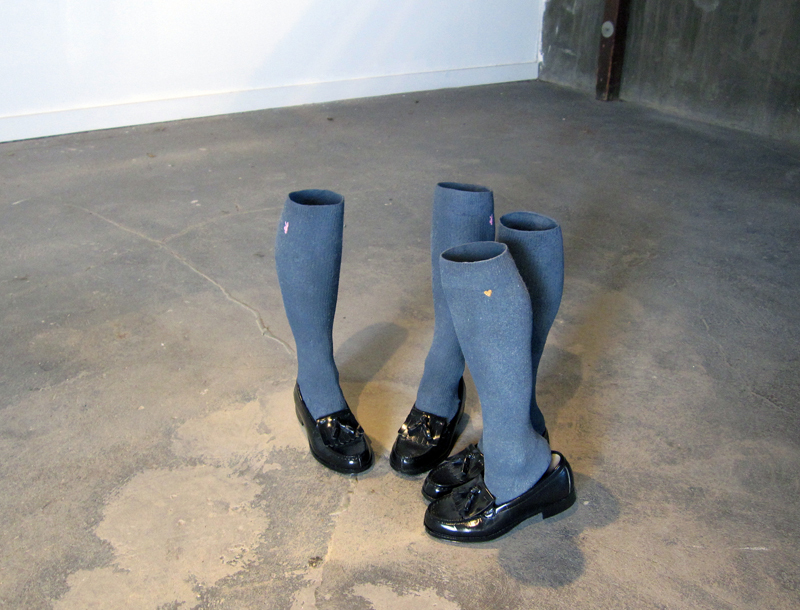 Sculpturally, Ruppe offers another set of amputated body parts: legs below the knee in repressive/sexual school girl pumps and stockings. Nearby, Jess Peri’s [UNT] digital prints continue the reductive strategy on product packaging, turning Bon Ami and Cliff Bars into Pop abstractions. Benjamin Terry’s Coral Snake [UNT], a primarily white figurative work presents another bold color pattern, this time challenging figure/ground assumptions. Terry’s piece balances the darker figurative, mixed media work of Giovanni Valderas, and both strong pieces are reminiscent of Matthew Bourbon’s work. A brace of colorful abstractions by Trey Egan [UNT] display dexterous paint handling, challenged in new media by Rusty Chapman’s painterly Creation Myth stop frame animation. Around the corner is a profoundly sarcastic photo, Ashley III by Elva Salinas [TWU], parodying fashion photography, and by proxy, the ill-advised trend to promote fashion photos in museums and art centers. 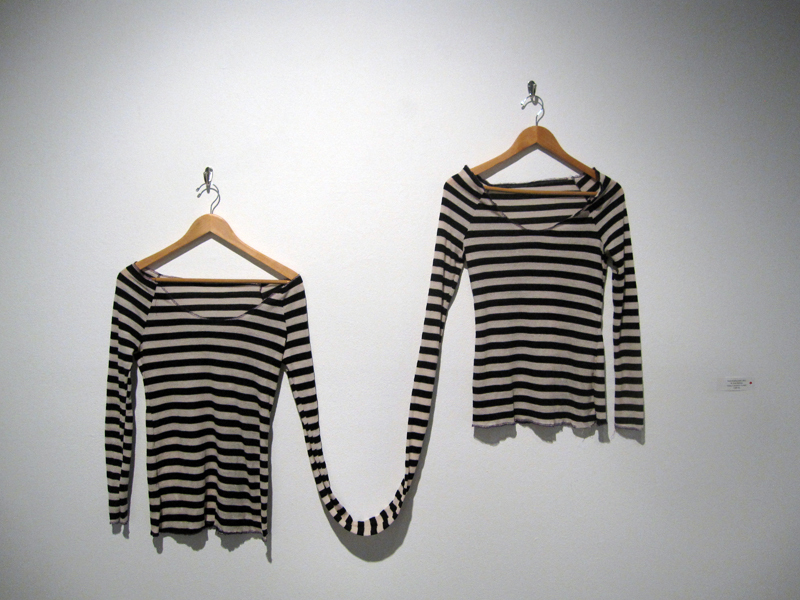 Not to be overlooked is the M. Kate Holmes Hand Holding Shirt [UTA], two Picasso-esque striped long sleeve shirts with one arm fused to connect both garments, and the audacious Here’s Another One by Shelby David Meier [TCU], a vinyl laminated 2×4 presenting itself as a commonplace 2×4. Conceptually echoing the exhibit, the poignant experiment collides with the plausible simulacra, generating new discussions and welcoming new voices. This entry was posted in Ryder's Writing and tagged 500X, college expo, dallas, review, Ryder by ryderr. Bookmark the permalink.